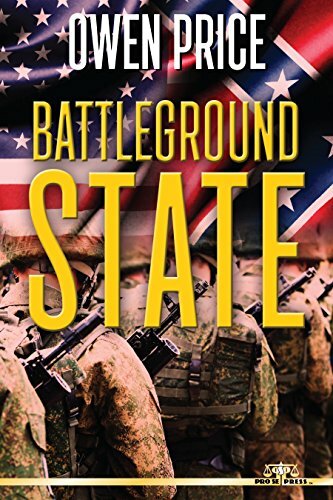 A high stakes game of cat-and-mouse plays out in dramatic fashion in a highly relevant thriller from Pro Se Productions, Owen Price’s BATTLEGROUND STATE is now available in print and digital formats. In order to achieve his goal of a sovereign Dixie Nation, fanatical Neo-Confederate dissident Thomas Marshall-megalomaniacal leader of the Southern Liberation Front- has forged an unholy alliance with Islamic radicals as well as various militant secessionist groups from around the globe. This clandestine conglomerate has spent years planning an international campaign of terror that will bring the world to the brink of World War III, thereby destabilizing global politics to the point that myriad governments become vulnerable to a coup-including that of the United States of America. His diabolical plan entering its final phase, Marshall begins to violently purge his organization of lackluster members. When Bradford County, Tennessee sheriff Craig Connor stumbles upon a pair of dismembered corpses branded with SLF tattoos, he begins to unravel an outlandish conspiracy orchestrated by Marshall and his revolutionary brethren. Joined in the field by rogue FBI agent Michelle Dobson, Sheriff Connor follows a trail of increasingly alarming clues that point toward the SLF committing a brazen act of terrorism upon American soil in the near future. In order to save the lives of thousands of civilians and potentially prevent the country he loves from being torn apart, Connor must find the elusive mastermind Thomas Marshall and put a stop to his outrageous scheme at any cost. In turn, Marshall must stay one step ahead of the surprisingly shrewd lawman and his beautiful, yet mysterious accomplice in order to fulfill his destiny. Featuring an evocative cover and logo design by Percival Constantine and print formatting by Antonino Lo Iacono and Marzia Marina, BATTLEGROUND STATE is available now at Amazon at https://www.amazon.com/dp/1541171241/ref=sr_1_2?ie=UTF8&qid=1482593835&sr=8-2&keywords=Battleground+State+priceand Pro Se’s own store at www.prose-press.com for 15.00. This modern thriller is also available as an Ebook, designed and formatted by Lo Iacono and Marina for only $2.99 for the Kindle at https://www.amazon.com/dp/B01N7LC5P4/ref=sr_1_1?ie=UTF8&qid=1482593835&sr=8-1&keywords=Battleground+State+price and for most digital formats via Smashwords at https://www.smashwords.com/books/view/691662.